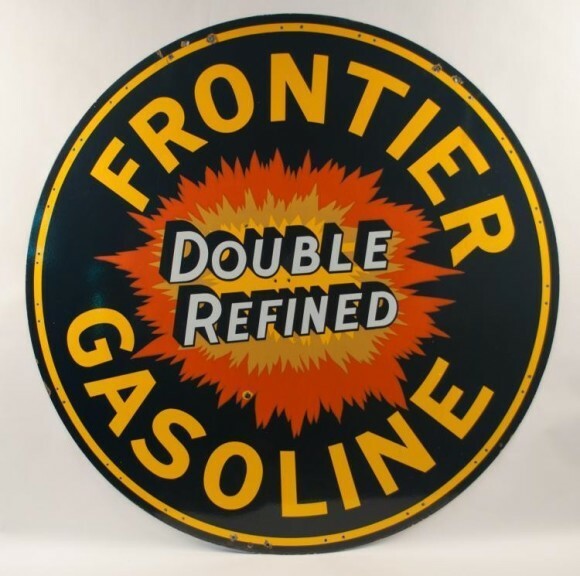 This large Frontier Gasoline Double Refined round sign is a double sided beauty. The red, orange, yellow, and black all create a very nice contrast. Measuring 60″ in diameter, the sign draws your attention because of the explosion illustration in the center. Exploding from the center is the text that reads “Double Refined.” The text has a black drop shadow made to help the text stand out even better. To the outside boarder of the sign is the text “Frontier Gasoline.” This is written in a vibrant yellow that really stands out on the black background.